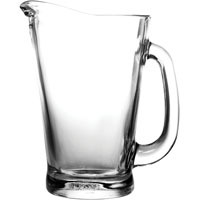 PRODYNE BIG ICE PITCHER� HWPDIP20 Stylish crystal clear acrylic pitcher with lid and thick removable solid ice freezer core that screws into lid. Keep pre-chilled beverages chilled for hours, no dilution from melting ice. Just fill ice core with water one time and keep in freezer until ready to use. 5 Quart (w/o ice core), 3. 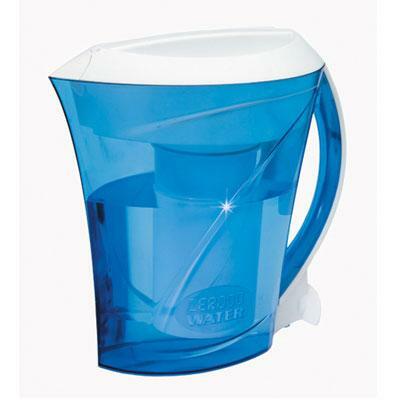 7 �” D x 8” H.
Enjoy pure-tasting water with the 10-Cup Zerowater Filter Pitcher technology. The ZeroWater filtration system combines FIVE sophisticated technologies that work together to remove virtually all dissolved solids from your tap water delivering you great tasting water. This 10-cup system comes withour patented Ion Exchange filter a laboratory-grade water testing meter and a guarantee to remove virtually all dissolved solids from your tap water. This item cannot be shipped to APO/FPO addresses. Please accept our apologies. 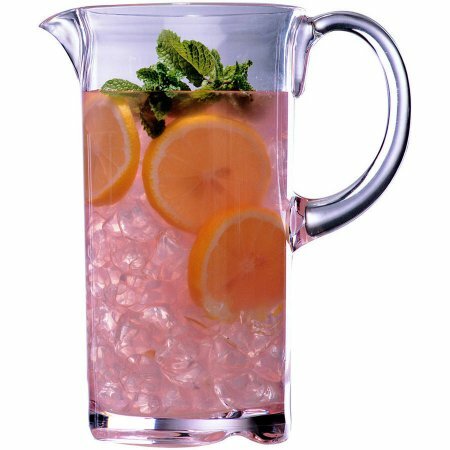 FRUIT INFUSION™ Natural Fruit Flavor Pitcher ENJOY REFRESHING LEMON WATER, RASPBERRY ICED TEA AND MORE Crystal clear acrylic pitcher has removable fruit infusion rod that screws into lid. Open slots in rod allow liquid and fruit to mix naturally. Fill the rod with cut lemons, limes, raspberries, etc. Pitcher may be continually refilled without having to replace the fruit. Clear 50 Oz. 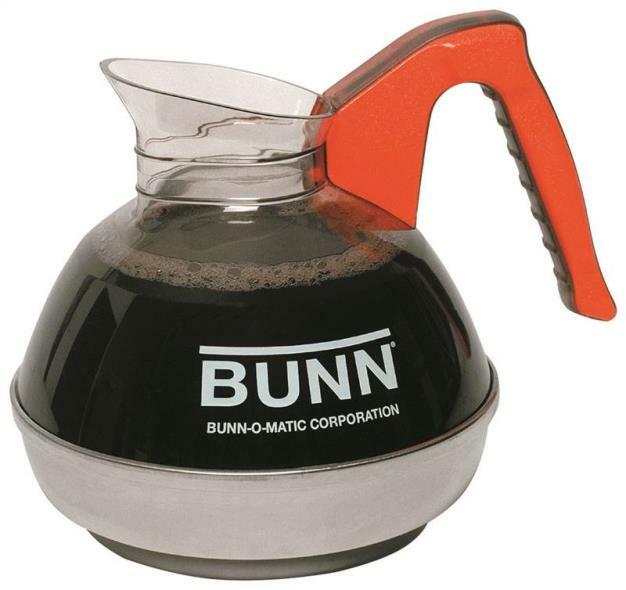 Beverage Pitcher. 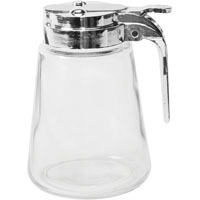 High-Clarity beverage server perfect for any table setting with the added convenience of hassle-free disposability. 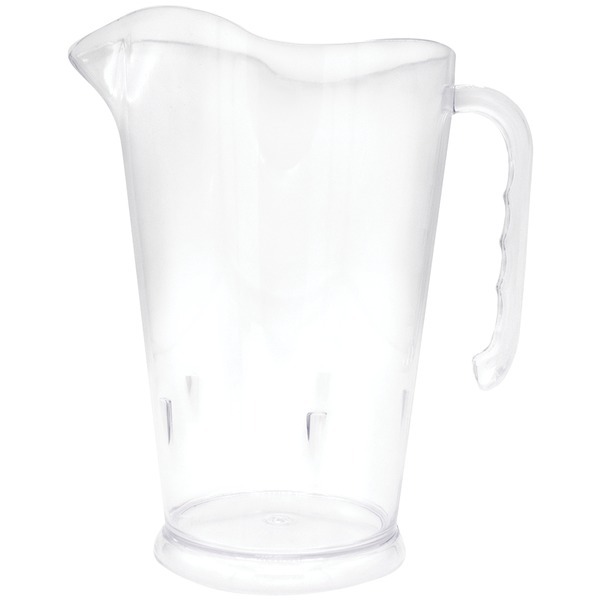 Iced Fruit Infusion Pitcher Enjoy refreshing beverages and keep them chilled with this attractive combo pitcher! 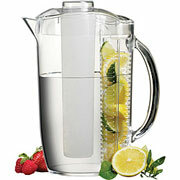 Just place cut lemons, limes, berries or mint into the removable fruit infusion rod and slide it down the pitcher. Open slots in the rod allow liquids and fruit to mix naturally to give your drink a wonderful fruit infused flavour. 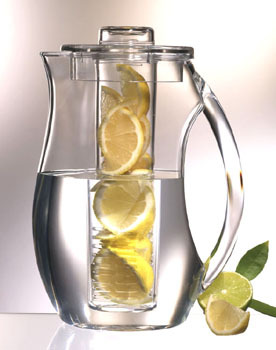 The pitcher can be continually refilled without having to replace the fruit. For meal and party use, attach the removable freezer tube to keep pre-chilled beverages cold for hours without ice cube dilution. Just fill the ice tube with water one time and keep it in the freezer. 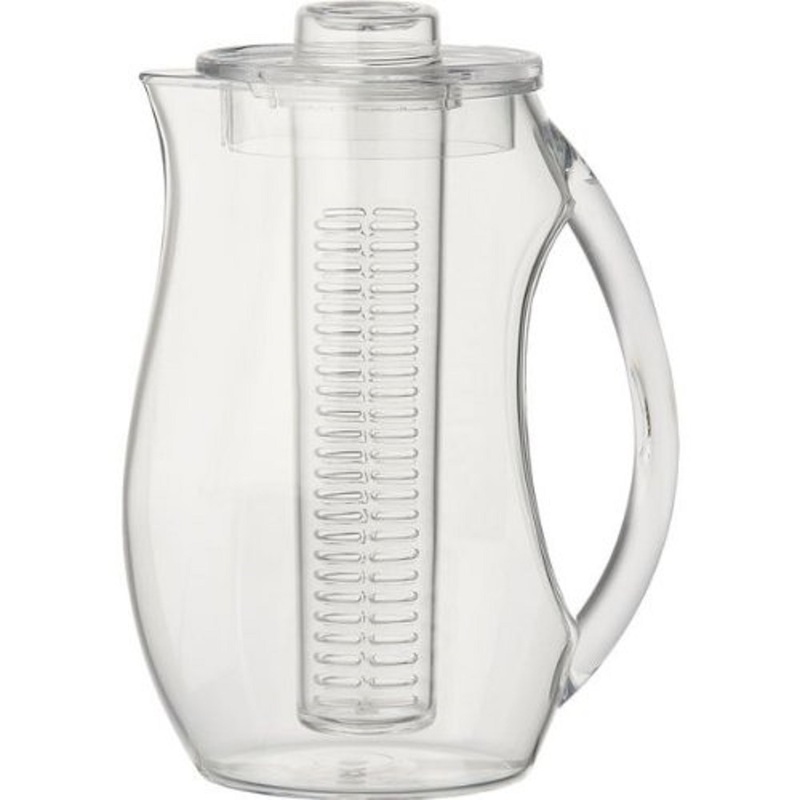 It can be re-frozen repeatedly without re-filling with water 3qt Crystal clear acrylic pitcher Includes removable fruit infusion rod that allows liquid and fruit to mix naturally Removable ice tube keeps beverage cold without watering down fruit Holds 2.
of liquid Model # FI-4. Designed for safety and lower replacement costs. Polycarbonate plastic resists chipping and breaking. Drip-proof spout, self-draining bottom. Dishwasher-safe. Contemporary design. 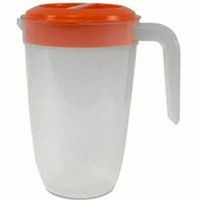 Capacity (Volume): 60 oz; Number of Cups: 7; Color(s): Clear; Material(s): Polycarbonate. When searching for the ideal decorative olive oil bottle for your kitchen, consider this recycled glass olive leaf design with metal pour spout. Manufactured in China, this 16.1 oz. 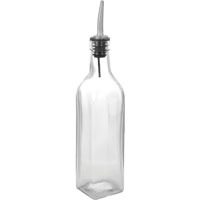 bottle is perfect for your favorite olive oil or hand soap. Hand wash only. 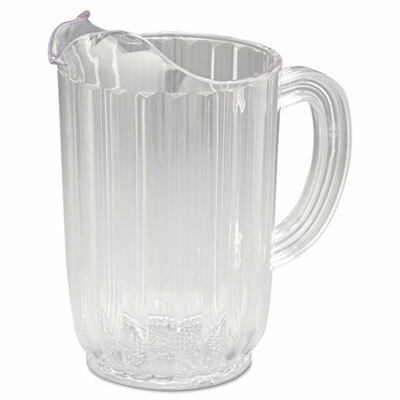 Lightweight, break-resistant polycarbonate pitcher looks like glass but performs like plastic. Special trap design keeps ice and beer-foam in the pitcher. Contoured lip ensures splash-free pouring. Ergonomic handle with thumb grip. 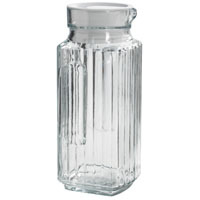 Capacity (Volume): 60 oz; Number of Cups: 8; Color(s): Clear; Material(s): Glass. 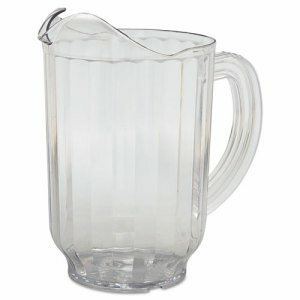 ICED™ PITCHER BEVERAGES STAY CHILLED FOR HOURS Stylish crystal clear acrylic pitcher has attractive white handle and lid accent. Removable solid ice freezer core screws into lid to keep pre-chilled beverages chilled for hours. No dilution from melting iced cubes. Just fill the ice core with water one time and place in freezer until ready to use. Ice core may be re-frozen repeatedly without re-filling with water.
) without ice core, 2. 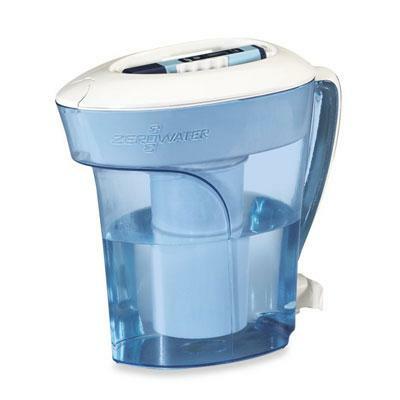 ZeroWater 8 Cup Clear Pitcher you can get cleaner fresher water without tapping into your plumbing line using bulky water coolers and wasting your money on expensive bottled water. 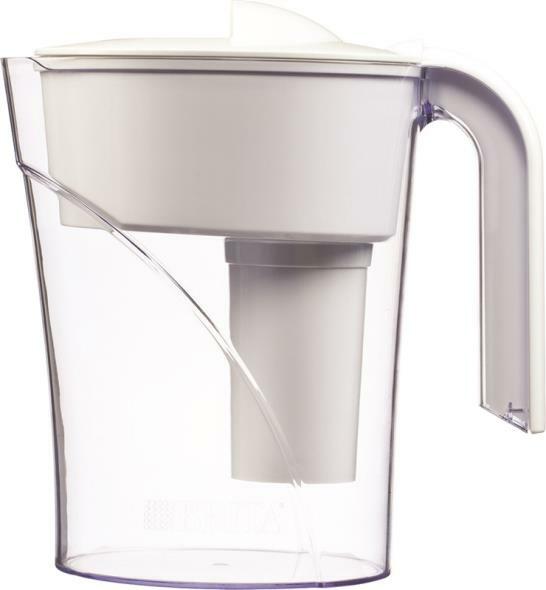 Thanks to an innovative five-stage filtration process the ZeroWater Pitcher offers more complete water filtration than ordinary carbon filters. 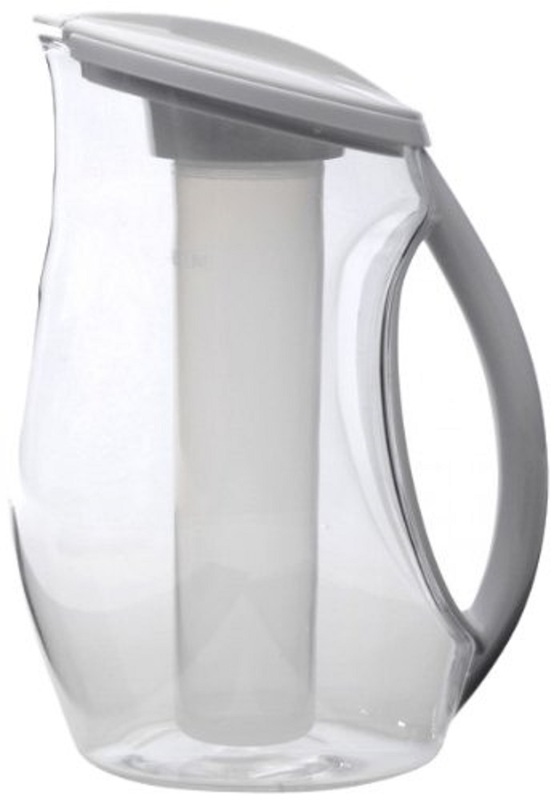 And for convenience this pitcher neatly stores right in your refrigerator door. This item cannot be shipped to APO/FPO addresses. Please accept our apologies. The Vinturi Red Wine Aerator mixes just the right amount of air with your red wine at the precise moment, while the wide base of the Vivid Wine Decanter offers wine even more space to breathe after it's been poured. The results are a better bouquet, enhanced flavor, & a smoother finish. Hand-made in Europe from lead-free crystal, the lightweight Vivid Wine Decanter features a slender, curved neck for easy holding and pouring. 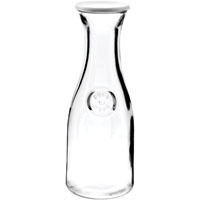 Its design fits our large wine decanter glass stopper. Made of durable acrylic, the Vinturi Wine Aerator includes a no-drip base. Both aerator and base are dishwasher safe. 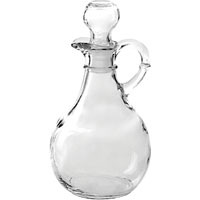 The European-made crystal wine decanter in this set is our most requested because of its elegance, functionality, and affordability. The inner dome increases oxygenation and allows you to better evaluate the hue and color of your wine. The finger-hold punt in its base ensures perfect and controlled pouring every time. Lead-free crystal. 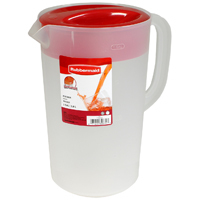 PRODYNE BIG FRUIT INFUSION PITCHER� HWPDFI20 Infuse water, tea, spirits and more with natural fruit flavors. 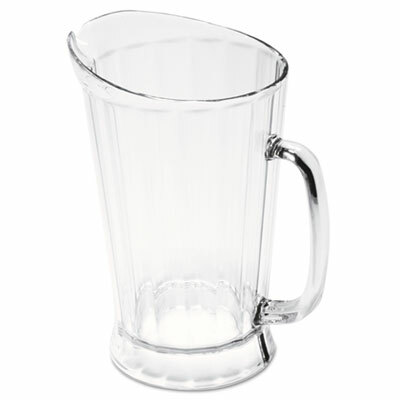 The crystal clear acrylic pitcher features a generous 3. 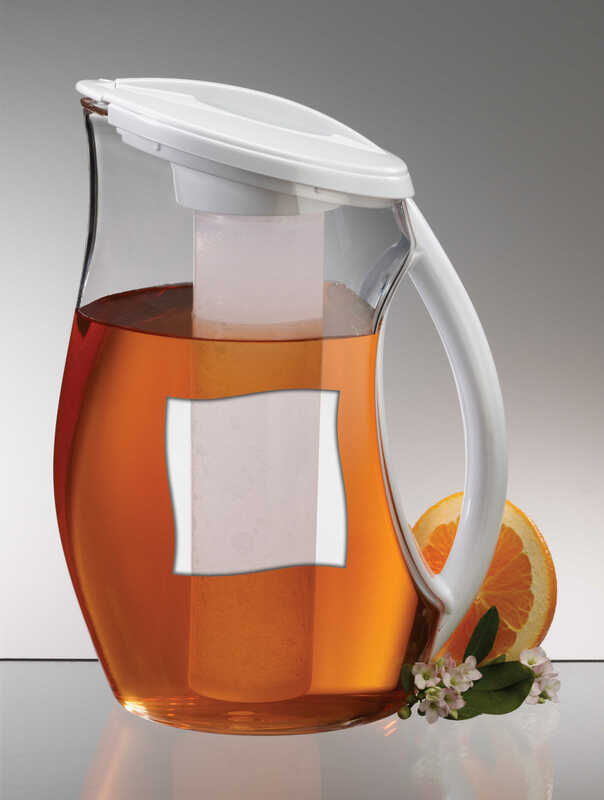 5 quart (112 ounce) capacity with a large fruit infusion rod that screws into the lid. Pitcher may be continually refilled as you use the contents without having to replace the fruit (replace fruit every 5-7 days). High style design with easy grip handle. Designed for safety and lower replacement costs. Polycarbonate plastic resists chipping and breaking. Drip-proof spout, self-draining bottom. Dishwasher-safe. Traditional design. 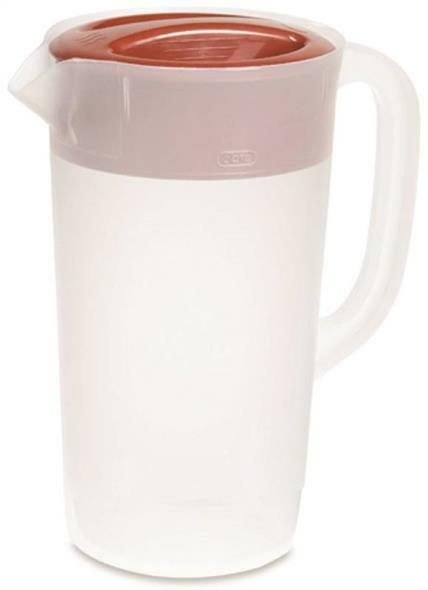 Capacity (Volume): 32 oz; Number of Cups: 4; Color(s): Clear; Material(s): Polycarbonate.